Tablet sales have started to go sour for many electronics brands - including giants like Apple - but that's not stopping local technology company MyPhone from continuing to push for these two Android slates in the entry-level category. What's good though, is that MyPhone obviously made sure that this duo would have a solid fighting chance by endowing them a number of attractive selling points, namely, affordable price, smartphone feature-set, and DTV functionality! Talk about giving buyers the most bang for their buck. The more affordable of the two is MyPhone MyT1 DTV with SRP of only Php 2,199. This one has a smaller 7-inch WSVGA (1024 x 600 pixels) display panel, a lower resolution 2MP camera at the back, a 2MP selfie cam, and a 2,500 mAh battery pack. At its heart, this Dual SIM 3G-enabled phablet runs its Android 5.1 Lollipop operating system with a 1.2 GHz Quad Core Spreadtrum processor that's complemented by 512MB of RAM and 4G of internal storage that's expandable through its microSD card slot. 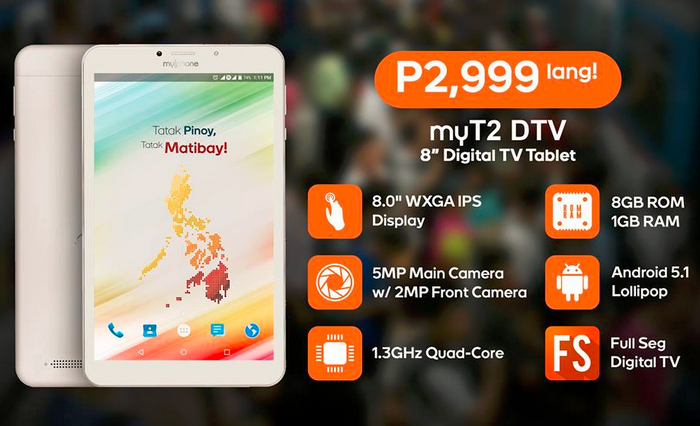 Selling for Php 2,999, MyPhone MyT2 DTV is the more expensive model. This tablet sports an 8-inch WXGA (1280 x 800 pixels) IPS display, a higher resolution 5 MegaPixel rear camera, 2MP selfie cam, and a 2,500 mAh battery pack. Also having Dual SIM Dual Standby capability and supporting 3G HSPA+ connectivity, this slate runs its Android 5.1 Lollipop OS with a 1.3 GHz Quad Core Spreadtrum processor, has 1GB of RAM, and comes with 8GB of expandable storage. These are by no means powerhouse devices in terms of technical specifications but they are certainly good enough for browsing websites, staying connected on Facebook, Twitter or Instagram, watching movies, viewing photos, playing light games, snapping photos and selfies, and sending chat messages. For those who are wondering, DTV is a television broadcast technology that supersedes analog. DTV easily beats its predecessor when it comes to audio and video quality. The main issue with it, however, is the limited number of channels available. So far, only ABS-CBN and ABS-CBN Sports and Action have consistent DTV signal across Mega Manila and in other parts of the country. In some areas, GMA7 and TV5 DTV channels can likewise be enjoyed. 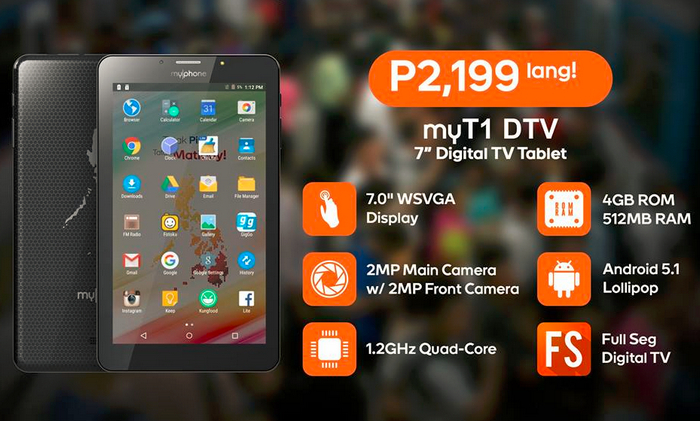 "Android Digital TV Tablet ng Bayan" MyPhone MyT1 and MyT2 DTV are now available at all MyPhone Concept Stores, kiosks, and authorized resells across the archipelago.